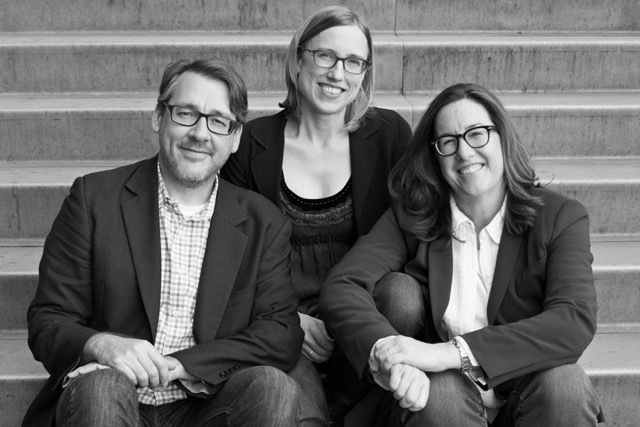 Publicists Kimberly Burns, Whitney Peeling and Michael Taeckens have formed a full-service publicity group, Broadside: Expert Literary PR, which will specialize in publicity and marketing for publisher-backed literary fiction and narrative nonfiction, as well as literary and mission-driven organizations and nonprofits. Clients can hire one, two or all three members for a campaign--although every project benefits from Broadside's collective experience, brainstorming and network of contacts. All three Broadside partners handle publicity campaigns; Taeckens also handles all aspects of marketing, web design and social media. "We each have a distinct style and set of interests, as well as varying areas of expertise, that complement each other in the best of ways," said Taeckens, who before starting his own company last year, was marketing director at Graywolf Press and publicity director at Algonquin Books. He also writes the "Reviewers & Critics" column for Poets & Writers. "With the media landscape changing so quickly, it makes perfect sense for Michael, Whitney, and I to team up," said Burns, who before starting her own company in 2003, worked at Knopf, Random House, Pantheon and the Penguin Press. She also serves on the board of directors of the Housing Works Bookstore and the Happy Ending Music & Reading Series and is a consultant for Creative Capital's Literature Grantees. She began her career working at several bookstores, including A Clean Well-Lighted Place for Books in San Francisco. "All of our current and future clients will benefit from our collective experience, brainstorming, and network of contacts." "All three of us have countless successful campaigns under our belts, and we believe collaboration always trumps competition," said Peeling, who before starting her own company in 2010, worked at Houghton Mifflin, Norton and PublicAffairs. "When we found the name Broadside--which, among other things, means the 'simultaneous firing of all guns from one side of a ship'--we knew it defined our approach." In an unusual move, McKenna Jordan, owner of Murder by the Book bookstore, Houston, Texas, has joined Minotaur Books as "a dedicated outside publishing consultant" and will make her experience "in the positioning, selling, and marketing of mysteries and crime fiction available on an exclusive basis to Minotaur's staff of editors and marketers," the St. Martin's imprint said. Jordan continues to own and run Murder by the Book. Minotaur v-p and publisher Andrew Martin commented: "Since I joined Minotaur Books in 2006, I have eagerly sought the advice of some of the great practitioners in the field out there handselling mysteries every day. McKenna was always very approachable, interested, energetic and wildly knowledgeable and insightful about the field. She personifies the best-case scenario of a bookseller as a publishing partner. It will be extremely valuable and exciting to have her on board officially as a unique part of our team." Jordan, who has owned Murder by the Book since 2009, said, "After years of handselling their titles on the front lines at Murder by the Book, I hope to be able to bring a unique, first-hand insight about how best to market and promote Minotaur titles to all consumers." In a Medium piece headlined "I don't want to buy books from Amazon anymore! 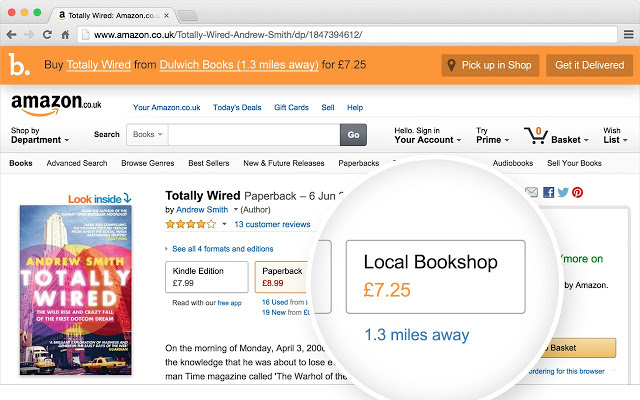 ", Will Cookson discussed the BookIndy Google Chrome extension, the website he created that "gives you the price of the book in your local bookshop while browsing" Amazon's U.K. website. He came up with the idea after asking himself the question: "Can you promote local independent bookshops on the very system that's designed to destroy them?" Amazon isn't always cheaper than your local bookshop. Books are sometimes out of stock on Amazon, but in stock at your local bookshop. Bookindy uses a brilliant service for independent bookshops called Hive, who deliver books directly from the wholesaler. Direct price comparison of books becomes strangely addictive! "I now browse Amazon and then buy books from Dulwich Books, my local independent bookshop, 0.8 miles away," Cookson noted. With the start of Book Expo America looming ever closer, Shelf Awareness is taking a look at this year's bumper crop of new titles. Our multi-part series on upcoming books--which began with installments on hot summer and fall fiction and nonfiction--was put together with the help of publishers and independent booksellers. Today we look at exciting young adult and middle grade titles coming later this year (and tomorrow we'll delve into titles for children and early readers). In stores on September 1, Nicola Yoon's hotly anticipated debut novel, Everything, Everything (Delacorte), is an Indies Introduce pick for summer/fall 2015. It is the story of Madeline, a teen with allergies so severe she hasn't left her house in 17 years. The only people Madeline ever sees are her mother, who is a doctor, and her nurse, until a new family moves in next door. From her window she sees Olly, a boy dressed entirely in black, and a complex relationship begins to develop. The story is told in a variety of formats, including prose, illustrations, charts and lists, and Yoon will be signing at both BEA and BookCon. Suzanna Hermans, the co-owner of Oblong Books & Music in Rhinebeck and Millerton, N.Y., said it looks like a "totally heartbreaking, one-sitting read." Shadowshaper, set for release on June 30 from Arthur A. Levine Books, marks urban fantasy author Daniel José Older's first foray into the YA world. Older's past work includes Half-Resurrection Blues, Salsa Nocturna and the anthology Long Hidden: Speculative Fiction from the Margins of History, which he co-edited. His newest book tells the story of Sierra Santiago, a young artist in Brooklyn. One summer she discovers that she has the ability to shadowshape, or imbue art with the power of ancestral spirits. But as she learns to use this new-found ability, she also learns of a killer that's tracking down other shadowshapers, and might be targeting her next. "Beautiful writing and a wonderful plot make this book a must-read," said Clarissa Hadge, assistant bookstore manager at Trident Booksellers & Cafe in Boston, Mass. "This is the book that I'll be shoving into everyone's hands this summer." Bestselling author David Levithan returns this summer with Another Day (Knopf). In stores on August 25, Another Day is the companion to his 2012 novel Every Day, which told the story of a teenager who wakes up every morning in the body of a different person but falls in love with a girl named Rhiannon. Another Day retells their story from Rhiannon's perspective. Levithan will be signing at both BEA and BookCon, and will be part of a We Need Diverse Books program at BookCon. Carolyn Anbar, children's room manager and buyer at Watchung Booksellers in Montclair, N.J., picked it as an exciting summer book for teens and adults. Rainbow Rowell's Carry On (St. Martin's Griffin) is another follow-up to a beloved YA title. Due out on October 6, Carry On is the companion to her 2013 bestseller Fangirl, about a young woman named Cath whose love of the fictitious Simon Snow series has guided her through her childhood and adolescence. Carry On is set entirely in the Harry Potter-esque world of Simon Snow, and recounts Snow's last year at the Watford School of Magicks. "It's a bit of a departure for her," said Hermans of Oblong Books & Music. "This is the first actual fantasy that she's written. I'll read anything she writes. I'll especially read this." Rowell will be at BEA, signing special editions of Fangirl that include an excerpt from Carry On. Another promising YA debut, and another Indies Introduce pick for summer/fall 2015, is Moïra Fowley-Doyle's The Accident Season (Kathy Dawson/Penguin). Likened to E. Lockhart's 2014 novel We Were Liars, The Accident Season tells the story of 17-year-old Cara and her family. Every October, they find themselves inexplicably prone to accidents, ranging from minor cuts and scrapes to life-threatening injuries. As another October approaches, Cara gets the feeling that this accident season will be particularly brutal, and she begins to unravel the dark family secret behind the accident season. Anne Holman, co-owner of the King's English Bookshop in Salt Lake City, Utah, said she expects big things from The Accident Season when it reaches stores on August 18. Ali Benjamin's The Thing About Jellyfish (Little, Brown) is a Middle Grade Indies Introduce pick for summer/fall 2015. Benjamin was the co-author of Positive, a memoir by HIV-positive teen Paige Rawl, and the young readers' edition of Tim Howard's memoir The Keeper. The Thing About Jellyfish, slated for release on September 22, is her first dive into fiction. It is the tale of Suzy, who loses her best friend in a drowning accident. She becomes convinced that her friend died because of the sting of a rare jellyfish, and soon Suzy sets out on a journey to find proof. Hermans of Oblong Books & Music said it looks like the "perfect mix of sad and wonderful for middle grade." Circus Mirandus (Dial Books) is Cassie Beasley's debut middle-grade novel and yet another Indies Introduce Pick. Hitting stores on June 2, Circus Mirandus is about a young boy named Micah Tuttle. Ephraim, Micah's grandfather, has told Micah countless stories about the magical Circus Mirandus. Among its wonders are an invisible tiger, a birdwoman and a powerful magician called the Man Who Bends Light. As Ephraim nears death, he offers Micah proof that the circus is real, and that the magician owes him a miracle. With the help of his friend Jenny Mendoza, Micah sets off on a journey to find the circus and save his grandpa. Laura Donohoe, children's and YA buyer at Malaprop's Bookstore and Cafe in Asheville, N.C., called Circus Mirandus "one of those rare books that completely captures the heart and imagination." Bookshop Santa Cruz hosted a sold-out event with John Waters Tuesday night at the historic Del Mar Theatre in Santa Cruz, Calif., for the paperback release of Carsick: John Waters Hitchhikes Across America (FSG). Waters was in conversation with local artist Jim Winters. What will you miss about the old space? The move, for me, is a little bittersweet. On the one hand, I exude excitement about bringing an indie bookstore back to Downtown St. Paul. On the other hand, I will forever miss the glorious wonder of that underground book-haven. 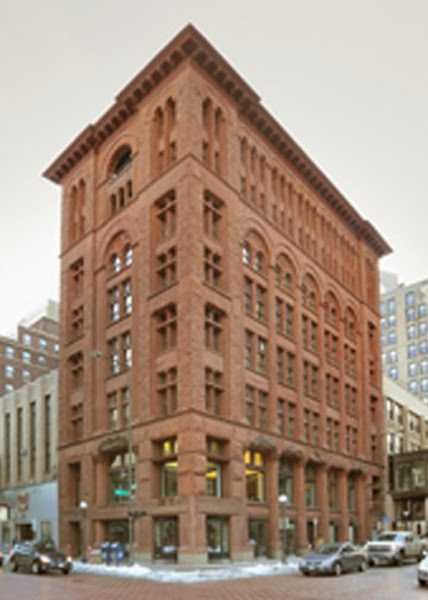 The beauty we were afforded in the historic Blair Arcade building will be incredibly tough to replicate. The Cathedral Hill space is where my girlfriend and I went on one of our first dates, which led me to working at SubText. The comfort and solitude that this space offered will always hold a special place in my heart. Having said that, I am confident in our ability to create a space where people not only can be comfy, relaxed, and welcomed, but also a space where they too can fall in love. What are you most looking forward to about the new one? I am most looking forward to collaborating with other individuals and businesses in the downtown community who are working tirelessly to drive the Downtown St. Paul renaissance. There are more residents in downtown than ever before, and private sector investment is returning. The prospect of being a contributing factor to the resurgence of this community is thrilling. Also, we'll be next door to one of the best record stores in the Twin Cities, Eclipse Records, and I'm excited to see which store most of paycheck goes to: books or records. Are you having any fun preparing for the move, or sensing that particular camaraderie that forms during a transition? I'm having a blast! I've been in the book biz for just under two years now and I've gotten my hands into almost every aspect of it. Now, I get the opportunity to basically design a store from the bottom up! It has been an incredible experience for me and I think it's has tremendous potential to be great for the store, and the community. I am so thankful Sue [Zumberge, owner of SubText Books] has given me this opportunity. There is definitely a sense of camaraderie, and I think that will be made even more clear when we actually start to pack things up and get settled in the new spot. How do you think it's going to feel on the first day when you open back up for business? RELIEF! I'm excited to have time to start reading again! My stack of 'to reads' has gotten unruly in the last month or so, and I'm ready to tackle it. I think it will be pretty surreal for the first few days in the new community, and I couldn't be more enthusiastic about the challenges and opportunities that lie ahead. Effective January 1, Independent Publishers Group will handle print and e-book sales and distribution in the U.S. and Canada for Fulcrum Publishing. Currently distributed by Consortium, Fulcrum publishes nonfiction for adults and children, including books on politics, wilderness, Western Americana, gardening, nature, history and culture. It also specializes in Native American materials and has developed a series of nonfiction comics. Two Fulcrum books slated for release in January will appear in IPG's Fall 2015 trade catalogue: Brothers of the Buffalo: A Novel of the Red River War by Joseph Bruchac and the 20th anniversary edition of Mountains of the Heart: A Natural History of the Appalachians by Scott Weidensaul, whose previous book, Living on the Wind: Across the Hemisphere with Migratory Birds, was a Pulitzer Prize finalist. With all the expenses that come with attending BEA, you'll be relieved to know that New York City offers an abundance of things to do that are free or cost very little. From all-access to the city's more than 1,700 parks to exploring architectural gems to soaking up some of art history's biggest influences, DK Eyewitness Travel Guides share some favorite things to do in New York on a budget. Enormous swaths of pastoral hills, woods, lakes and streams--stretching out along 50 blocks--make up New York's most treasured green space, Central Park. 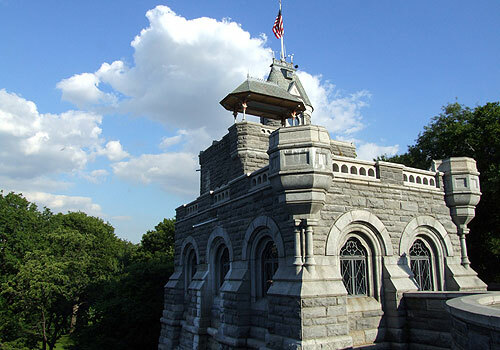 Begin your journey at the Henry Luce Nature Observatory inside Belvedere Castle, a mini-castle with the highest views of the park. Binoculars are available for bird-watching at nearby Turtle Pond. Next, head out for a hike through the Ramble, a wooded nature preserve strewn with trails that wind through forest, glades, and a stream known as the Gill. When you tire of your explorations on land, take to the water. Frederick Law Olmsted, one of Central Park's designers, carefully positioned ponds, lakes, and streams throughout the park, the largest of which is Central Park Lake, best discovered via a rowboat rented at the Loeb Boathouse. To experience more of what Central Park offers, join a free Welcome Tour, offered on Wednesday, Friday and Saturday over the BEA week. Entrance to New York's extensive parks system is free of charge. If you're looking for some cultural cachet after BEA show hours, you're in luck. Many museums allow free entry on designated days and times. The 9/11 Memorial & Museum offers free museum entry on Tuesday evenings, with tickets distributed from 4–6 p.m. Admission to the memorial is free from 7:30 a.m.–9 p.m. daily. 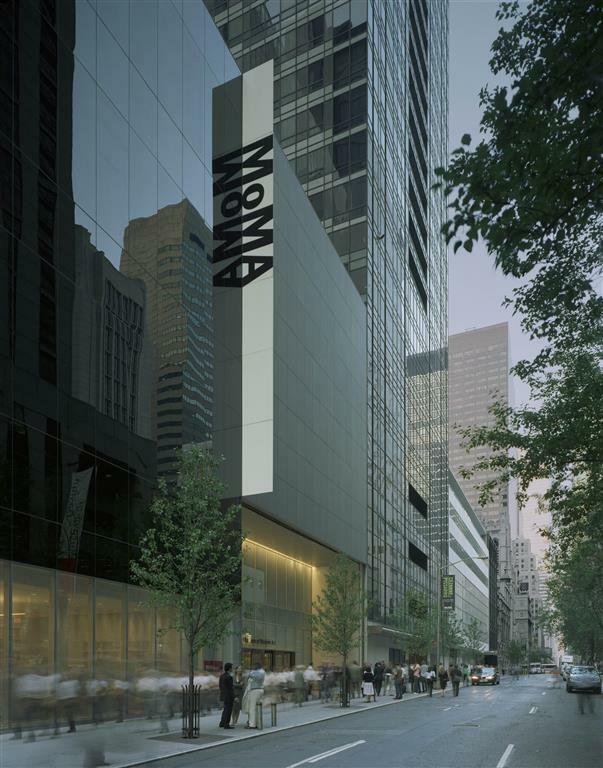 Get your Friday night fix at the Museum of Modern Art (MoMA), free from 4–8 p.m. on Fridays. The museum offers a double draw: the world's largest collection of modern art and sculpture, and a unique building, which is a contemporary masterpiece in itself. In addition to the famous paintings on permanent display, current exhibitions include a Bjork retrospective and a survey of Latin American architecture. For a more traditional take on art, head to The Frick Collection on Sunday and pay what you wish from 11 a.m.–1 p.m. The collection takes up residence at the Gilded Age mansion once home to Henry Clay Frick, who assembled the impressive array of Old Master paintings, European sculpture and decorative art pieces before his death in 1919. 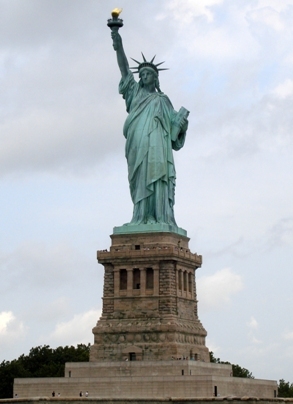 When French sculptor Frédéric-Auguste Bartholdi designed the Statue of Liberty, he chose what became known as Liberty Island for its installation, since at this site he believed the 305-foot-tall monument would be visible to every ship entering the New York harbor. He was right, and one of the best ways to get up-close to Lady Liberty (without visiting the island itself) is to take a free trip on the Staten Island Ferry, which departs approximately every half hour from the Whitehall ferry terminal in Manhattan. To get the best view, avoid riding during weekday rush hours, when the ferries are packed with commuters. Public transit will take you to another magnificent New York City landmark, Grand Central Terminal. And while a subway ride to get there will cost you $2.75, taking in its splendid Beaux-Arts architecture is free. More than 2,500 gold-leaf stars form the constellations illuminating the vaulted ceiling, and a sculpture of Mercury flanked by Hercules and Minerva crowns the main entrance. Nearby, the New York Public Library Schwarzman Building showcases more Beaux-Arts splendor. 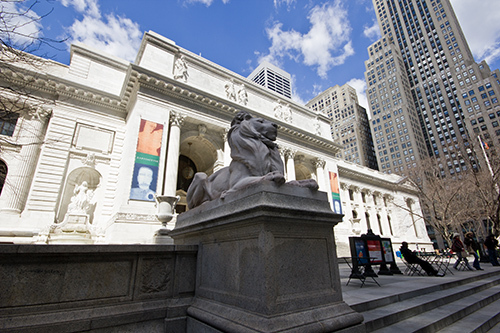 With its proud lions guarding the entrance and a labyrinth of shelves groaning under a mind-boggling collection of books, the New York Public Library is the world's largest. Also on display are the original Winnie-the-Pooh toys that belonged to Christopher Robin Milne and that inspired his father, A.A. Milne, to write his famous book about the honey-loving bear. For more insights and recommendations from DK Eyewitness Travel Guides on things to do in New York City and more than 200 other destinations around the world, visit DK Travel online. Green: A Field Guide to Marijuana by Dan Michaels and Erik Christiansen (Chronicle Books), a book that aims to take pot appreciation to the level of wine or coffee. Tomorrow morning on CBS This Morning: Samantha Heller, author of The Only Cleanse: A 14-Day Natural Detox Plan to Jump-Start a Lifetime of Health (Countryman Press, $24.95, 9781581573039). Tomorrow on the Talk: Brad Garrett, author of When the Balls Drop (Gallery, $25, 9781476772905). Tomorrow on Tavis Smiley: Gregory Pardio, author of Digest, winner of the 2015 Pulitzer Prize for Poetry. Sally Wainwright (Happy Valley) will write and direct a drama about the Brontes for BBC1. The Bookseller reported that To Walk Invisible: The Bronte Sisters "will explore the relationships between Charlotte, Emily and Anne Bronte and their brother Branwell, who was an alcoholic and drug addict.... The program will also explore how their self-educated father, who grew up in poor, rural Ireland, encouraged his children to become passionate about literature." BBC1 controller Charlotte Moore said, "It's an extraordinary tale of family tragedy and their passion and determination, against the odds, to have their genius recognized in a male 19th-century world." 7 p.m. Thomas Fleming, author of The Great Divide: The Conflict between Washington and Jefferson that Defined a Nation (Da Capo, $27.99, 9780306821271). Jennifer Willoughby has won the fourth annual Lindquist & Vennum Prize for Poetry for her manuscript Beautiful Zero, which was chosen from more than 150 submissions from poets across the Upper Midwest. Willoughby receives $10,000, as well as a contract for publication of the work by Milkweed Editions. Poet and prize judge Dana Levin said Willoughby's "very alive first collection" features poems "whose speakers tumble and swerve as they urgently try to inhabit and describe the contours of being strange and alive in our electrified now." Beautiful Zero will be published in November. The Turner House: A Novel by Angela Flournoy (Houghton Mifflin Harcourt, $23, 9780544303164). "The greatest testament to the skill of a writer is the ability to make what might seem alien to the reader completely recognizable and utterly engaging. Such was my experience reading The Turner House. Mine is a tiny white family from a small town with no sense of heritage, yet every moment I spent with the Turners--a family of 13 children shaped by the Great Migration to Detroit--I felt at home. Their struggles and joys are universal, yet told with an exacting eye that always finds the perfect detail. This is a truly impressive debut." --Kim Fox, Schuler Books & Music, Grand Rapids, Mich. The Memory Painter: A Novel by Gwendolyn Womack (Picador, $26, 9781250053039). "Most of us can't remember our early childhood. What if, thanks to a powerful experimental pharmaceutical, you could access ancient memories--not your own, but other people's--and acquire their skill sets and languages, too? Neurogenetics may be a new frontier, but for artist Bryan Pierce, it's not about a drug, it's all about dreams--dreams in which he might be re-experiencing lives stretching back millennia and gaining dangerous knowledge. Womack couples modern science with imaginative concepts of time, history, and myth in this masterful debut." --Barbara Peters, The Poisoned Pen, Scottsdale, Ariz. The Sea Inside by Philip Hoare (Melville House, $17.95, 9781612194363). "Part poetic introspective, part elegy, laced with a slow sense of wonder, Hoare's new book is a uniquely refreshing work. In some ways it is a memoir; in others a naturalistic account of travel and contemplation. The result, however, is neither autobiography nor another volume in environmentalist polyphony, but the genuine and comfortably deliberate thoughts of a man who, in our age, still looks to the sea and its myriad life forms with the wonder of an explorer of old. It is bracing to discover a voice that conjures the magic of nature without the heavy hand of dogma." --Brian Boecki, Between the Covers, Harbor Springs, Mich. The Map to Everywhere by Carrie Ryan and John Parke Davis (Little, Brown, $17, 9780316240772). "When Marrill climbs aboard the ship that appears in the middle of a desert parking lot, she's thinking only of helping her mother, not saving the world. Soon she has sailed far from home and into an unknown world where her only chance at returning home is the magical Map to Everywhere. Marrill, together with a decidedly forgettable master thief named Fin, a curiously tattooed Pirate Stream captain, and a determined wizard, must traverse remarkable and sometimes dangerous lands to locate the map that will save--or possibly destroy--those that seek it. The Map to Everywhere is full of adventure, humor, and heart and readers will quickly fall for tenacious Marrill and the unforgettably forgettable Fin." --Sara Grochowski, Brilliant Books, Traverse City, Mich.
Solitaire by Alice Oseman (HarperTeen, $17.99, 9780062335685). "Tori Spring is a typical mopey teen. She feels most at home on the Internet and regards her peers with equal parts disdain and distrust. She worries about her brother, who has a serious eating disorder, and feels increasingly distant from her best friend, whose life seems more and more to revolve around boys and parties. A friend from the past, a mysterious stranger, and an anonymous pranking organization called Solitaire will push Tori toward more actively engaging with her life. As Solitaire's antics escalate, Tori is forced to make decisions that will affect both her and everyone around her." --Sarah Sawyers-Lovett, Big Blue Marble Bookstore, Philadelphia, Penn. Our Souls at Night: A Novel by Kent Haruf (Knopf, $24, 9781101875896), the last novel of the late author, is set in Holt, Colo., where Plainsong, Eventide and Benediction were set. Radiant Angel: A John Corey Novel by Nelson DeMille (Grand Central, $28, 9780446580854) is the seventh thriller starring former NYPD detective John Corey. Dietland by Sarai Walker (Houghton Mifflin Harcourt, $26, 9780544373433) follows a woman seeking weight loss surgery who gets recruited into a guerrilla feminist group. Gemma Bovery, based on the graphic novel about a French man obsessed with Gustave Flaubert by Posy Simmonds, has a limited opening on May 26. One doesn't have to respect a book's principal characters to appreciate the story. In Sophie McManus's admirable first novel, The Unfortunates, the pettiness of the privileged and their sense of entitlement take center stage. McManus gets all the details right and nails the overbearing philanthropist matriarch, Cecilia "CeCe" Somner; her son, George, an opera librettist dilettante; his former coat-checker (now part-time condo realtor) wife, Iris; and CeCe's distant, lesbian daughter, Patricia. In her late 70s, CeCe suffers from a degenerative disease that threatens her micro-management of the fund-raising social events that once filled her calendar. Her illness prompts her stay at the tony Institute for Clinical Research campus, where she berates nurses and doctors while desperately hoping an experimental treatment will slow her disease's pace. There, upstate from her 40-room "cottage" on Long Island Sound, she frets about George's failure to visit, sends detailed domestic assignments to her long-time housekeeper and reminisces about her failed marriages and the tainted sources of her ancestral wealth. CeCe doesn't approve of much and especially dislikes the confinement caused by her encroaching palsy. She goes from ordering around the waitstaff at a yacht fundraiser ("set yourself to extracting those Brazil nuts from the mix. No one ever wants a Brazil nut.... Bartenders, we will not serve anything with a straw") to trying to fill empty hours at the clinic. George, however, has been under her critical thumb for so long and is so dependent on her deliberately limited financial support that he barely manages an undemanding foundation job, where he idly scribbles at what he believes is a breakthrough modern opera. When it fails to attract any established New York company, he finances its production with heavy loans backed only by the bank's assumption that his mother will make them good. Miffed at his failure to visit her, she doesn't. The opera is a disaster (CeCe describes it as "a train hitting a merry-go-round... like the very incarnation of an atrocity"), and George loses his money and job as he retreats into delusional isolation. In debt and hounded by bill collectors, Iris sells their Somner heirloom jewelry and antiques, and invests their meager savings with George's former classmate's private equity fund--just before it is charged with securities fraud. It would appear that this financially fortunate family's follies turn them into "unfortunates" indeed. But McManus knows the wealthy well. When the Somner backs are to the wall, their money salves a lot of wounds. As outsider Iris discovers about the rich, "when they lose their money, they've only misplaced it." The Unfortunates is an irresistible novel about old money and the sometimes wayward, sometimes admirable behavior of those who have it. The Somners are an upsetting lot, but as Iris says about a disturbingly graphic novel she is trying to read: "It's a book. The more upsetting the better." --Bruce Jacobs, founding partner, Watermark Books & Cafe, Wichita, Kan. Shelf Talker: Sophie McManus's first novel is a knowing, often funny saga of a wealthy New York family and its presumptions, privilege, secrets and regrets.